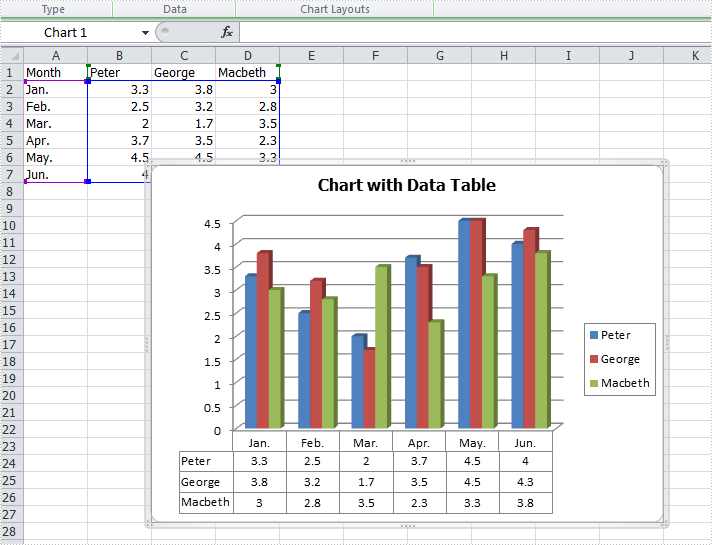 In Excel, we could use charts to visualize and compare data. However, once the charts are created, it becomes much difficult for us to read the data precisely from charts. Adding a data table below the chart is a good solution for which the chart and data are on the same place. This article is going to introduce the method to add a data table to the chart that is based on the data in C# using Spire.XLS. Note: before start, please download the latest version of Spire.XLS and add the .dll in the bin folder as the reference of Visual studio. Step 1: Create a new workbook and add an empty sheet. Step 2: Fill cells with sample data. Step 3: Create a Column3DClustered based on the sample data. Step 4: Add a data table to the chart that is based on the data. Step 5: Save the document and launch to see effects.